A mysterious house harbors an unimaginable secret . . .
It’s wartime, and the Carver family decides to leave the capital where they live and move to a small coastal village where they’ve recently bought a home. But from the minute they cross the threshold, strange things begin to happen. In that mysterious house there still lurks the spirit of Jacob, the previous owners’ son, who died by drowning. With the help of their new friend Roland, Max and Alicia Carver begin to explore the suspicious circumstances of that death and discover the existence of a mysterious being called The Prince of Mist— a diabolical character who has returned from the shadows to collect on a debt from the past. Soon the three friends will find themselves caught up in an adventure of sunken ships and an enchanted stone garden, which will change their lives forever. The Prince of Mist was absolutely fantastic. This book is a paranormal thriller set during WWII. A family moves to a town on the beach – one that has a history of a mysterious shipwreck. Creepy things start happening and it's up to Max and Alicia (brother and sister) to find out what is going on with the help of a native boy named Roland. I was definitely creep-ed out quite a bit reading this book and I loved the twists and turns this novel took. Definitely a thrilling read. Max seems fearless to me. He dives headlong into the mystery surrounding the town no matter what the consequences. Through his eyes, you also get to know Roland – a local boy who is fun-loving and up for the adventure – as well as his older sister Alicia – who he felt he never truly knew until they moved. 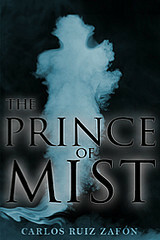 And the Prince of Mist – what a truly horrible bad guy. I shiver just thinking about how evil he really is. Final Verdict: There's many ways to relate to this book – relationships with family, romantic relationships, moving to a new place. I really also loved the creepiness of this story. Seriously, it was so thrilling. Cover Commentary: Very fitting to the plot! Kristen is the co-blog owner of The Book Monsters. Kristen is an Elementary School Library Media Specialist in the Chicago suburbs who loves reading. Why else would she be a librarian? So glad you loved this one! I did too – and I’m not a ghost/horror fan at all. Sounds like a good one. “I shiver just thinking about how evil he really is.” Love when books can give those kinds of feelings. I’ve only recently stumbled upon this book and it does grab my interest. Whilst I’m not really a big fan of anything that’s capable to creep me out, I think I’m still willing to give it a go based on some promising reviews that I’ve read! Ooo – sounds like a good one! Thanks for the review. Great review. I love all paranormal and that is a great cover as well. Sounds really good. Great review. This book sounds really interesting. Saw this one while I was shopping online at Barnes and Noble, but I wasn’t sure about it. Glad it was good! I love it when authors mix historical fiction with fantasy/paranormal! I’ve had my eye on this book for awhile, but I get scared easily so I’ve been hesitant to pick it up. But man it sounds interesting!